There are several web-building spiders that may be found in and/or around a home. These types of spiders specialize in the construction of silken-based webs that aid in the capturing of prey. Many web-building spiders construct webs that are designed to capture insects that fly. Then, there are web-building spiders that specialize in webs that are close to the ground so that wandering insects may be captured. While most of these amazing spiders will remain with the webs that they construct, the male web-builders are known to wander away from their webs in search of female adults. In this two-part series, you will learn a bit of information on the most popular of all web-building spiders. One of the most popular of all web-building spiders is the European House Spider. This arachnid is often called “Hobo Spiders” and “Barn Funnel Weavers”. These arachnids may vary from very small in size to as large as the palm of a hand. In most instances, they are found in areas that are dark and have a high level of moisture. Examples of these areas include – but, are not at all limited to – the basements of homes, near plumping fixtures, in wood piles, and underneath rocks. These construct webs that resemble funnels. They will often sit in the funnel region of the web to wait for prey. If these are found wandering in the home, it is most often a male spider that is seeking a female companion. 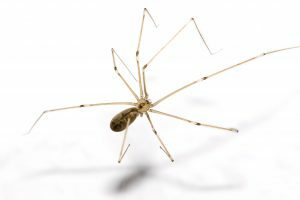 The Long-Bodied Cellar Spider is up to 7/16th of an inch in length, but, have very long legs. In most instances, these pests are found in a web located in the top corner of a room that has very low lighting. Naturally – as their name indicates – they are commonly found in the cellars of homes. In addition to this, they may be found in a stairwell, underneath stairs, and in areas of a building that is not often used. These spiders tend to prefer indoor areas, but, may be found in outdoor gardens and outdoor living areas. The Long-Bodied Cellar Spider builds webs that are loose. They hang in the web in order to ensure capture of their prey. These spiders will prey on absolutely anything that enters into the web. If danger is sensed, they will vibrate the webs rapidly in order to successfully obscure their exact location. This spider is very similar in appearance to the daddy longlegs Opiliones. The European House Spiders and the Long-Bodied Cellar Spiders are two of the most common types of web-building spiders found in and/or around a home. 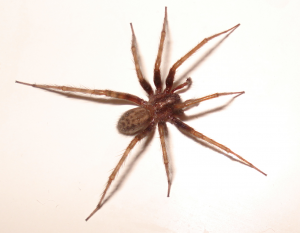 If you discover these arachnids in your home, it is imperative that you seek the assistance of a professional pest control agency to aid in their removal. The agency will be able to safely eliminate the spider and remove the webbing that the spider has constructed.